Lady and the Tramp. Walt Disney Pictures 1955. Movies of my Yesterdays is a new irregular series where instead of writing about a movie I’ve never seen, I choose a movie important to my past and discuss why that is. 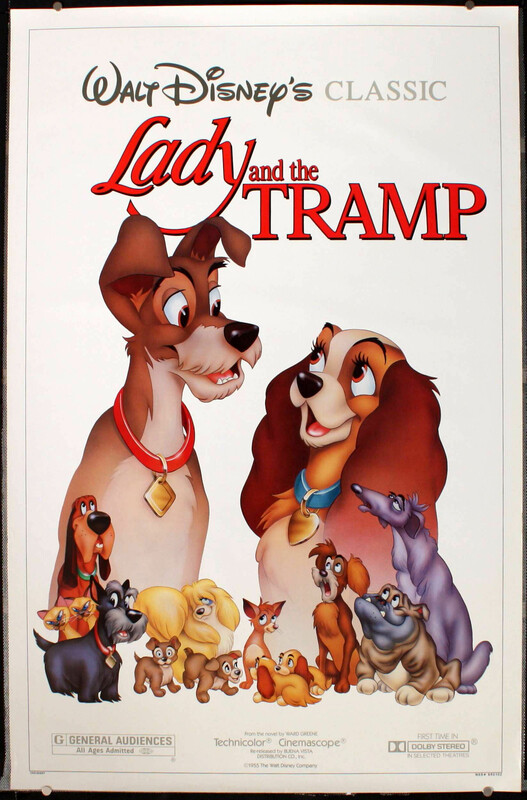 It is fitting to start with Lady and the Tramp, because not only is it bookended with Christmases, but it’s the first movie I had growing up. I don’t remember a time with it as the only tape, and there were others more important to me later, but this was the first. As the first, it inspired the house rule that we could only watch a thing once a day, for my parents’ sanity. It is a rule I’ve long internalized, though occasionally I’ll break it and rewatch something brand new to me within a few hours. It still did not save the tape, which was the furthest gone by the time we gave up on the Betamax player. Obviously, I remember the love story the most, but there’s quite a bit of adventure gotten up to that certainly appealed to me. But at the start, I think what was important to me as a very young child was that it was about dogs and it was a cartoon. It never mattered to me that it was about a girl dog, or that it was a love story. Maybe I was more invested in the male characters that are pretty much every other dog, but nobody taught me to be afraid of “girls’ stories” at that age. Kids will be happy with any well-told story until they’re told why they shouldn’t be. Later, I remember being embarrassed about how interested I was in seeing Pocahontas, but that was when I was older and more socialized. I reached a point in my early teens when I noticed that there were several movies I’d seen so often that I was just letting them wash over me without thinking much about what was going on. Perhaps that awakening to analyzing what I was watching was the beginning of what I do here. Coming back to this I think I’ve spent long enough away from it to break out of that old brain dead habit, but even so, there’s plenty of new things to notice and appreciate. I never really gave much thought to the human story going on, with the growth of Jim Dear and Darling’s family, as more than how it affects the dogs. I never considered how much the dogs’ story is rooted in the real lives and mannerisms of dogs as understood by humans. This is every moment familiar and every frame new.